@Little India | Get Your Grub On! 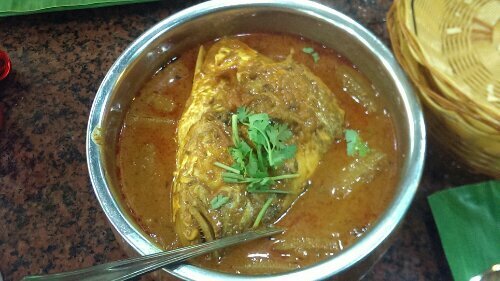 We came back here and this time after along while ordered their famous ‘Fish Head Curry‘ again. The head was humongous, mean looking and meaty. It was beautifully soft and tender, especially the cheeks that were freak’n awesome. 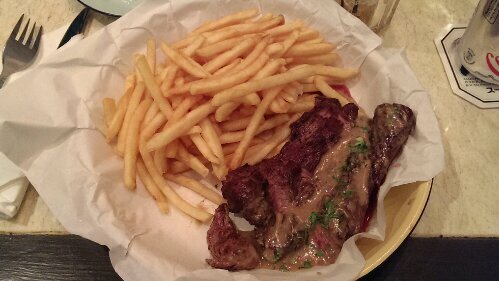 The gravy was quite liquid, milky, oily and deeply rich with a fantastic heat that sneaked up on us the more we ate. A beautiful dish that probably will never win any beauty contest but who cares, it’s the inner values that matter, right? The service today was terribly awful though. First our order of ‘Naan‘ was completely forgotten, after another 15 minutes waiting the wrong order showed up and when we had pretty much finished all our other dishes and were fully stuffed finally the right breads came along. As always the staff was very polite and friendly but unfortunately there wasn’t even the slightest attempt to service recovery. And then those weird iPads again, which become even weirder in a restaurant where you usually eat with your hands, I just don’t get it. This was the first time of my many visits here that the service was that screwed up so as long as this doesn’t become a pattern and the food stays delicious I don’t see any reason not to come back. 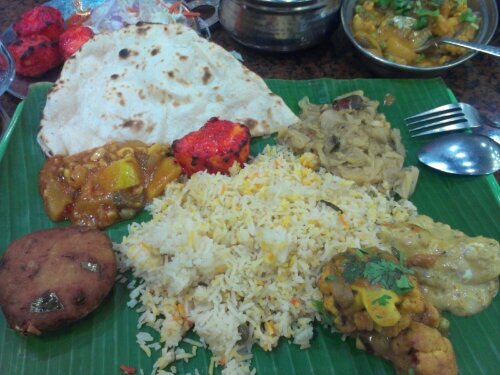 A good old friend is back in town and he wanted to go back to his favorite Indian place in Singapore ‘The Banana Leaf Apolo’ on Racecourse Road in Little India. As an appetizer we ordered the ‘Fish Cutlets‘ which had a nice soft, completely unfishy texture with only a hint of fish taste to them that was accompanied by a nice herb & spice mix as well as whole bay leaves. All served cold with a green tangy mint gravy. My favorite, the ‘Fish Tikka‘, is marinated in a delicious red gravy and was grilled perfectly sealing all the juices within each tikka cube. It tasted very light and fell apart easily so I didn’t really need to chew. Another meat dish we ordered was the ‘Chicken Korma‘ which was heavily rich and creamy. Not being an expert in Indian cooking, I believe that korma is usually cooked with yoghurt and cream but here the gravy also had a light coconut taste to it. It was good but I felt heavier with every bite. Lastly a vegetarian ‘Gobi‘ (cauliflower) dish with onions which was the only really spicy food we had but unfortunately there were rather few gobis and much more onions in it. Some people might say that the Apolo is a place for tourists but it is still my go to place for Northern Indian food. The choice is huge and the dishes taste great and the only reason I don’t come here more often is that I’m scared I would soon roll my way around.